If you are Google+ user like us, then here is a cool Addon for your Chrome browser, which allows you to schedule your Google+ post for later. 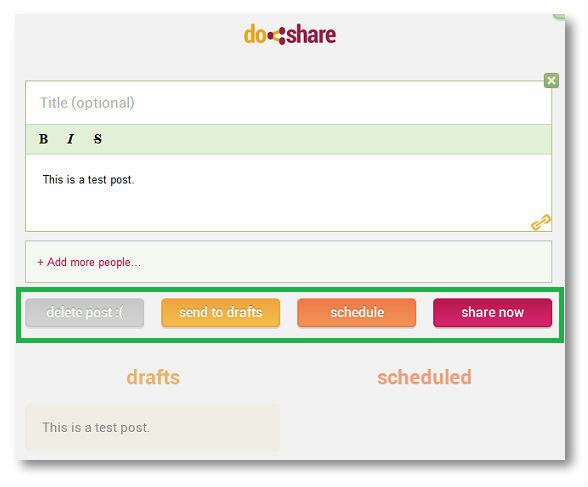 Do share is free Google Chrome Extension which let you schedule your Google+ posts. This chrome browser extension is very simple to install, and even easier to use. To install this you have to install Google Chrome browser on your PC and the Do Share Extension. There are so many free extension are available for Google Chrome, but this one is new for Google+. Also Twiiter has so many web apps which allows you the same to schedule your tweets for later, but Google+ doesn,t have so many web apps and tool. So we can say this one is the one and only addon for Google+. With the helps of Do Share extension you can save your Google+ posts as drafts or schedule them for the later time of your choosing. 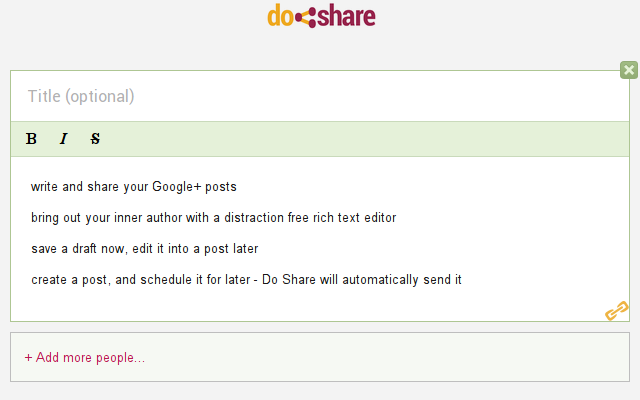 Some feature of the Do share extension are Write and share your Google+ posts, save a draft now, edit it into a post later, share any photo from your Google+ album. Once you install the extension on your Google Chrome browser, click the Do share extension button from the browser tootlbar menu to start with Do share. Now create new post and then fill in the details of your message. After creating the post you can add the circle or people in the message (Same as Google+) after that you can save it as drafts to share later or schedule the post for later, or share it immediately. If you schedule the post for the later then you have to set the time and date for the post to go live. That’s how simple it is! The extension works perfectly on Google Chrome. So if you are Google+ user and want to save your posts as drafts or schedule them for a later time, then Do Share is the must have extension for you.